Demon armies, daggers plunged into the hearts of kings and literally sucking the beauty out of young women… it's all just a day in the life of "Snow White and the Huntsman," the latest take on the classic tale, which opens this weekend. 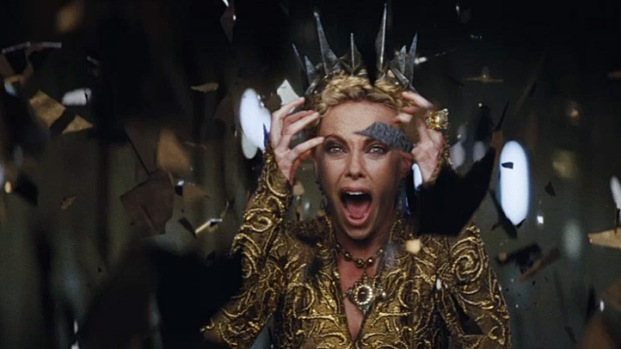 But compared with the Brothers Grimm's original "Snow White and the Seven Dwarfs," the action movie starring Charlize Theron and Kristen Stewart is practically a picnic. The Grimms' original "Snow White" is a terrifying tale packed with cannibalism, hot iron shoes, a dance to the death and a prince in love with a dead girl. It's a wonder kids don't wake screaming after reading it. Throw in the fact that the original Snow White is by any reasonable measure a moron, and one has to wonder how this story has endured, and why little girls aspire to be her. 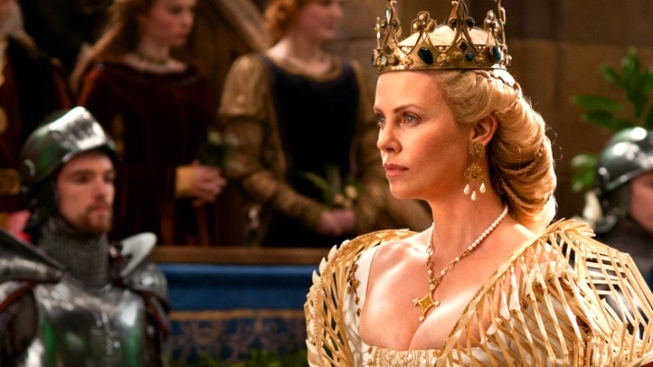 Kristen Stewart, Charlize Theron and Chris Hemsworth star in this epic adaptation of the classic fairy tale. Opens June 1. The secret to Snow White's two-century success is that it's packed with universal issues about the cycle of life, vanity and tragedy, and it's constantly evolving, allowing it to comment on the times while retaining its core. "It's really a crazy story -- there's so much going on, and so much of it seems nonsensical to a modern reader," said Edith Zimmerman, editor of TheHairpin.com. "I think people would be like, 'What is this? This is like four stories in one?" And yet, as bizarre as some of the story's surface elements may be, you'll find some stark truths about humanity. "It runs on mother-daughter rivalry, doesn't it?" posits Maria Tatar, professor of Germanic Languages and Literature at Harvard University. "That is the bones of the story, as it were, and a sort of inter-generational sexual jealousy." Prof. Jack Zipes of the University of Minnesota has been studying Snow White for decades, and he has witnessed firsthand the struggle between mothers and daughters. "('Snow White') addresses how women feel about getting old, and not being beautiful and vivacious. The eating of (Snow's) liver or heart is sort of like (the Evil Stepmother) has to destroy the young person to become young again... . And there is a perhaps, a disposition in our genes for this type of conflict. My daughter, she's 27, and the mother-daughter relationship in our family has been very intense at times -- but they get along now," he adds with a chuckle. Zipes also notes that the villain is a stepmother and not a biological mother because the Grimms loved their own mother so much. The past decade or so has seen the rise of a subcultural phenomenon in America, "cougars," as the battle between older and younger women has become more heated, and it gives the story of Snow White a little extra punch, says Tatar. "It's not necessarily they're both rivals for the affection of the father, but the father becomes a metaphor for something bigger, for just attractiveness in general," says Tatar. "And it does capture our anxieties about aging." And both scholars point out that the stepmother is the more interesting of the two women in the story, more knowledgeable and more intense. Though "Snow White" has been part of the Western canon for more than 200 years, it was the 1937 Disney version that really cemented the story's place in our culture. "It’s really powerful and scary and dramatic," says Tatar, "We need to understand that story. (Walt) Disney is not culturally innocent, and he takes us to the culture of that time. It's a story that engages with the Great Depression, even—'Whistle While You Work,' there's Snow White humming a tune, animals help her carry out these dreadful domestic chores—it's so revelatory of that culture." In addition to its spin on the Great Depression, the film also features a scene where the Evil Stepmother descends into the cellar to disguise herself before heading off to trick Snow, a moment that gets to the core of anxieties about fading beauty. "We see her aging, her hands become gnarled, and covered with spots. Her nose grows. And her voice changes from that of a younger woman to an old hag, and there she is cackling at us with this frightening visage showing the ravages of time—it is about mortality," Tatar says. Among the adaptations Zipes finds most interesting is a parody of the Disney version, "Bob Clampett’s 'Coal Black and the Sebben Dwarfs," which is appallingly racist to modern sensibilities, and was in 1968 named one of the "Censored Eleven," a collection of Looney Tunes and Merrie Melodies cartoons that were withheld from being broadcast ever again, but has been hailed as one of "The 50 Greatest Carrtoons" ever made. Poet Anne Sexton in 1971 crafted Tatar's favorite spin on the story, with her poem "Snow White and the Seven Dwarfs," that dismisses Snow White, as that "dumb bunny." Sexton wrote her poem in the as the feminist movement was achieving critical mass. Forty years later, it's hard to argue with her assessment of Snow's intellect. "Snow would have a hard time today. 'Gullible' is a generous word," says Zimmerman. "She seems... unusually, unforgivably dim to a modern reader." But Zipes points out that this picture of a young woman in the early 1800s isn’t entirely off the mark. "In the 19th century, women were kept at home, they were not allowed to travel, they were not educated… they were, in a certain sense, made stupid," says Zipes. Back in the 2012 versions -- both "Mirror Mirror," the rom-com version of Snow White starring Julia Roberts released in March and this week's "Snow White and the Huntsman" -- there are two major changes to the classic story that make it feel more current. In both films, we see the Evil Stepmother undergo all manner of ablutions to hold onto her beauty; any Botoxer would nod appreciatively. More importantly, both films have Snow being not nearly so passive, as we see our heroine actually take up arms to defend her life and her realm, in action-packed sequences set against a bleak, forbidding backdrop. Though "Snow White," like many of the Grimms' tales, wasn't necessarily meant for kids, the story clearly resonates with children—but why? Does your average 4-year-old really worry about mortality and aging? "We all want to control our lives, we all want to be kings and queens and princes and princesses of our own lives," said Zipes. "And so when a little girl or boy says they want to be a prince or princess, what they’re saying is, 'I want to navigate, I want to determine the narration of my life. I don’t want to be persecuted or punished; I want to have the power in order to obtain the happiness that I want.'"